I've been on the hunt for a really good full midi skirt for quite some time. This search was only intensified when I came across a fantastic option in H&M one day. The trouble was they only had one left and it wasn't my size. Several trips to various H&M's and web searches later, I was ready to admit defeat. That's when fashion fate stepped in and I visited the Bow & Drape website where I discovered the perfect full midi skirt. 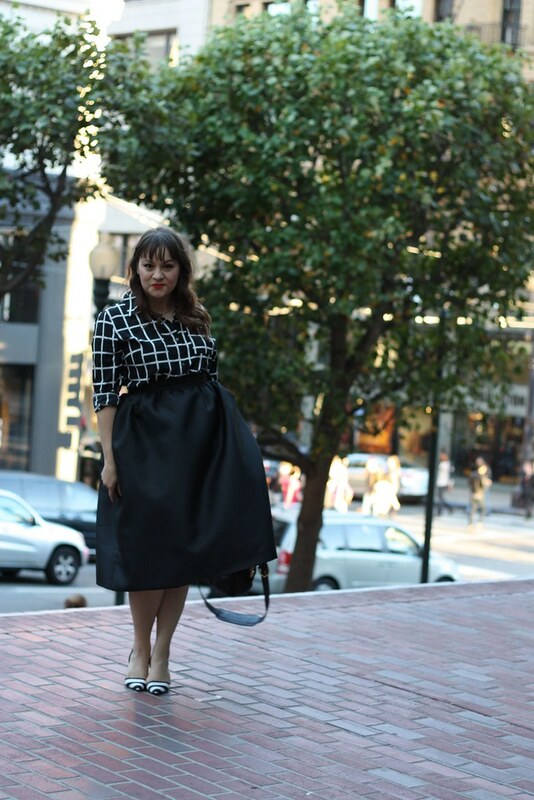 Dubbed "The Hepburn," this skirt was made to order by the dressmakers at B&D. Sure, I had to wait a few weeks for this perfectly structured skirt, but it was worth every second of the wait. As an added bonus, I met Rachel Roy while out in this outfit. Not only was she was full of compliments and told me I was "doing everything right from the top down to the shoes" but she thanked me for inspiring her. Just go ahead and add that to my list of top moments of my life. Can I wear this skirt every day? You truly look amazing in that skirt! I really want this skirt! Makes me wish I was not pregnant right now! Looks fab and great Rachel Roy story!! Love that grid-print skirt with those shoes! You met Rachel Roy???!! Kels and I LOVE her! Tell me what she wore! What was she like in person? Oh my gosh, she is so down to earth. She was in a monochrome outfit with a black jacket, b&w top, and black pants--so chic! And she was being so nice about my outfit, so complimentary. Definitely a top 10 life moment for me! Fact: the midi is the best skirt ever. I love the shape of this one, it's so chic! Thanks, Robin! It's got to be one of my favorite pieces in my closet, ever!